If you’re into car leasing, you’ll know good quality motors are distinguishable immediately. Even if a classy car has its logos ripped off, all you need to do is sit inside. Right away you feel the difference between a ‘run-of-the-mill’ vehicle and a refined one. 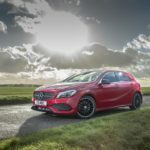 The latest Mercedes-Benz A-Class is a good example. Inside, it’s sumptuous.